This entry was posted on Tuesday, June 8th, 2010 at 12:43 pm	and is filed under General, Tech. You can follow any responses to this entry through the RSS 2.0 feed. You can skip to the end and leave a response. Pinging is currently not allowed. What are you saying?! But ofcourse, Apple has started its operations in India, albeit with just one undercover employee. Who? The author of this blog, amigo. every second story reads like an Apple advert / press release. Why don’t you just start writing those? Love Apple all you want, but if you’re writing for a daily, stick to a fair and reasonable way of writing, like any journalist should. Save your Apple love for the iForums. please mail this leter. we need to know what;s on apple’s mind when it comes to india market. I dont understand why Indian journalists write stale reviews of products which get much better international coverage…I would like to read David Pogue or Walt Mossberg on tech gadgets unless the review is for an Indian product/India specific product/ the review comes out earler than the whole world has written about it! As an Apple fan and iPhone user, couldn’t agree with you more! I must have spent over a $100 on iPhone apps. But Apple’s lack of enthusiasm is linked with our telecom companies’ reluctance to subsidize the handset and reduce entry barriers. Without 3G the telecom operators have no chance hell of improving revenues through data services on the iPhone. Apple Company policy on India. Look seriously into this aspect where a giant market is awaiting for the premier products from the Apple company. Loves to be in touch with you! An article which cannot go unread. Mr. Jobs, we expect the next launch of Apple to be in India and we promise to provide you the biggest market for all your innovations. The writer of this article deserves a response and we await your revert. Wish Steve reverts and pay some heed to Indian apple lovers! If India is not imp for Apple, why do u people slave at their feet - i am sure u led normal lives before this co developed these products - so you shud be able to live normal lives if you forsake their products. Teach them a lesson to treat you well ! If you read STEVE JOBS bio-graphy, you will know that he had spent about 6 months in the Himalayas. And I am sure he loves India as much in his personal life. However, when it comes to Business, Let’s face it. People in INDIA are not yet spending as much on Apps and besides, the Telcos Pricing of IPHONE puts it out of reach of the millions of potential subscribers. Besides, some Innovation is required on part of TELCOs to get people to use more GPRS and Data Services. Its basically not the failure of the IPHONE but failure of the innovation at TELCOs. They are too busy getting easy money from low - paying subscribers who do not complaint about poor service quality. So, we will have to wait till one of the TELCOs comes up with a UNIQUE FINANCING PLAN, that will make IPHONE a mass phone. 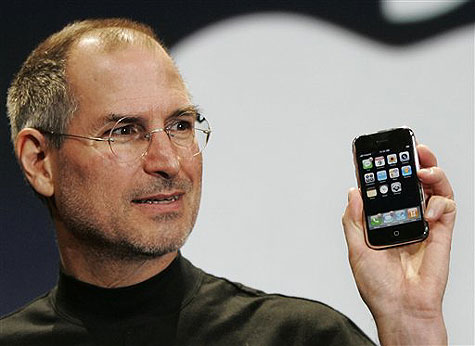 Then, your wish ( and mine too) of seeing STEVE JOBS launch IPHONE ( Version 10 may be) in INDIA will get fulfilled. Could not have agreed more! I am more of an Ipod enthusiast, and haven’t ventured into Iphone as the prices are too much…. I think Apple is waiting more for better networks and 3G launch in India before they give us a second look…Till then….sigh…. A Great Read For Me . Mr.Steve Must reply for this one.